Aaron noticed there were not many turtle eggs sold on the open market. He couldn't find a single one. Aaron smiled. "At least the government is preventing the sale of turtle eggs," he mumbled to himself. "I'm afraid that's not so!" a voice suddenly appeared behind him. Aaron turned around an faced a British tourist. 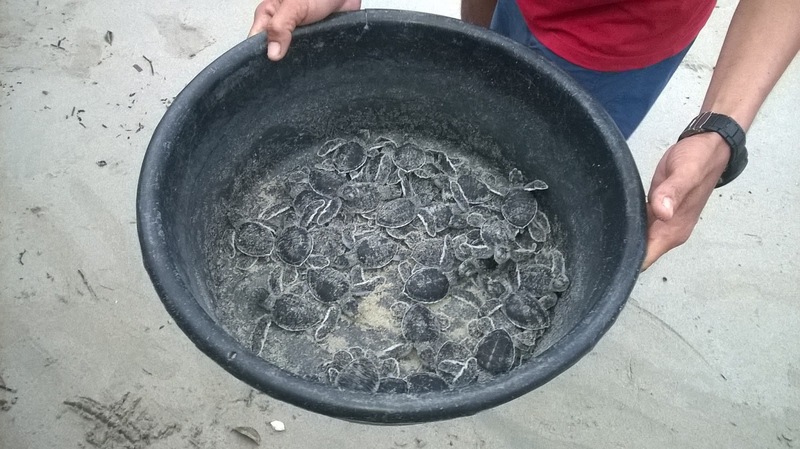 "The lack of turtle eggs is because the country run out of them, not because of government control. They don't care!" THE EURASIANS page 84. My novel was describing a situation decades ago. At that time people consumed turtle eggs just like they were eating chicken eggs! I believed at that time people thought turtle eggs were inexhaustible. Nowadays, the constant reminder by the conservation and environmental societies through their educational programs at least made the people realized how important it is for us to protect our fellow living things. What made me marveled was these people were not urban people. They were rural dwellers and they understood the importance of conservation! I strongly believe that people should appreciate their efforts and assist them in any way they can. Success! First hurdle is over! It was indeed an emotional experience watching the baby turtles struggling at the beach to make way for the sea. At least, this time, humans are the one that protected them at the beach as they dashed towards the water and 100% of them got away. But in the sea, they are on their own. There is nothing much we human could do but hope. At least there are no casualties on the beach. Naturally, they will face precarious problems on the beach such as predators which include crabs and sea birds. Even harmless footprints could be an obstacle to them. Turtles are cold-blooded reptiles characterized by a special bony shell developed around their body.